The Leeds is made of smooth soft cow leather with a fully calf leather lined bootleg. The Leeds is a very flexible boot, with a very tight fit throughout, even around the ankle. The rear zipper runs down the calf to the sole. 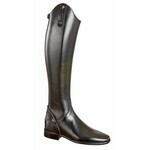 It is an all purpose riding boot with an elastic section allowing for 1,5cm stretch around the calf, knee and ankle. The boot has a heel reinforcer protector for spurs which also protects the zipper. The Leeds has an elegant carré-mould. The demanding rider will find the special comfort footbed and slim ankle fit very useful. The Ago glued sole has a non-slip profile and is extremely durable. The Leeds is made of smooth soft cognac croco print calfleather with a fully calf leather lined bootleg. The Leeds is a very flexible boot, with a very tight fit throughout, even around the ankle. The rear zipper runs down the calf to the sole. The Leeds Multi Colors is made of fine calf leather, smooth version,with fully calf leather lined bootleg. Zipper instead of rib, running to the sole and elastic stretch material in the calf- and ankle area.